We took up residence near this little guy in Freehold, NJ. Having never seen a black squirrel before, and being naturally inquisitive, I Googled “black squirrel” to see if they are the same creature as the grey ones we’re more used to seeing (they are). But as luck would have it, the second link on the Google page was to the Black Squirrel Bar in Washington, DC, our very next stop. Even more fortunate, the Black Squirrel is just a couple blocks away from our favorite Korean restaurant, Mandu, where we had already planned to meet a friend for dinner. Another sign? Without question. The Black Squirrel calls itself a “gastro pub,” which I guess is supposed to mean they have good food. We didn’t go there to eat, but we did sample a calamari and vegetable appetizer dipped in tempura batter and served with chipotle tartar sauce. It was a little salty, but certainly better than the standard pub grub. They also claim to serve Belgium’s best wheat beer, (it’s not). Fortunately, they have plenty of other options on the menu, including some fantastic beers made by Great Lakes Brewery in Cleveland, Ohio. We’d never heard of Great Lakes before, but a helpful bartender introduced us to them, and now we’ve added another place to stop on our to-do list. That’s one cute squirrel. I’ve never seen a black one before. Oh so sweet – I’ve never seen a black squirrel either and your photo is quite beautiful. Cute squirrel, and you’ve gotta love it leading you to a pub! That one should be pet! Ha. Love it. Or maybe the lead in a “children’s” book: Chauncey, the drunken squirrel. I first saw one in Maryland and thought the poor thing had fallen into some paint. Very, very cute! Thanks for visiting my blog. That’s good research Sinclair. Thanks for sharing. Wow, Sinclair, you know your stuff. I’ve seen a couple of black squirrels before and if I ever see one again, Squirrel Burgers!!! Yes, but is it? (related, I mean) Very sweet but I like the red ones best. Grey squirrels were introduced over here (UK) and have decimated our population of red quarrels that survive in only a few remote regions. They are now considered vermin here or as we call them bushy tailed rats. That doesn’t stop us thinking they are cute though, and I’d rather have them than real rats in our roof!! you can find black squirrels in nyc in an area called stuyvesant town on the east side of manhattan. i was surprised to discover them. we moved below stuyvesant town to the lower east side neighborhood and last spring our neighbor spotted a black squirrel! nice to know they can be found in nj too. Definitely a sign. On an unrelated note, though, what did you eat at the Korean restaurant? And Mandu’s Bibimbap is incredible!! Yes, I’m a big fan of Bibimbap. Especially when it comes in the hot stone bowl. Also, thanks for the link! Thank you for visiting my Cambodia trip. I like your blog. Happy traveling! Thanks for liking our Southeast Asia blog. Squirrels around here are the giant red flying kind! Looking forward to the giant flying red squirrels when we get out that way. for sure. If you see an animal AND find out there’s a bar named after it… it’s like God himself telling you that you should relax and enjoy a pint! Marysville, Kansas is also known for its black squirrels. Very nice to have you over at my blog, Brian! Regarding black squirrels, I worked one summer during college on a small island in the river where Lake Huron and Lake Erie met between Ontario, Canada and Michigan. The place was thick with black squirrels. Especially noteworthy was the lack of any on either mainland. I’ve kept my eyes out for them ever since and love seeing them–thanks for sharing! Thanks for visiting my blog today and liking “The Lighthouse”. I’m so glad your visit brought me to your blog. Fantastic post above. Can’t wait to learn more about your adventures. Please stop by again soon! Thanks for stopping by my blog. I look forward to more of your posts and photos. Regards. Boy, that sure makes fodder for some crazy jokes! Serendipity comes to people who are alert to see the connections. I like the way you “notice” – and the way your “liking” my blog lead me to your Seven Lessons … to which a hearty hear-hear! What’s even stranger to me is the fact that the first time I saw a completely white squirrel was precisely in front of the white house in Washington D.C. The closest we’ve got to squirrels are pesky possums! I hope you’re including Australia on your world adventure. Happy traveling. I look forward to eating more of your blog. Thanks for reading my blog and liking my post! I’ve never seen one either! They look like the rich relative of the brown squirrel we have. You know, all dressed up in black. This might be the first time I’ve seen a black squirrel. We have seen plenty of grey ones, brown ones and red ones. Thank you for sharing, Brian and Shannon. Your Freshly Pressed award is WAY awesome. You certainly deserve it (have only just seen it). Congrats. There is a community of black squirrels in Princeton, too. I saw some in my neighborhood near Washington, DC and blogged about them here. http://sandydgreen.wordpress.com/2010/09/28/a-scurry-of-squirrels/ Thanks for visiting my blog! I ‘m glad to know there are black squirrels also.I have only ever seen grey ones.I like your picture of the black squirrel.Thanks for visiting my blog. Nice story. 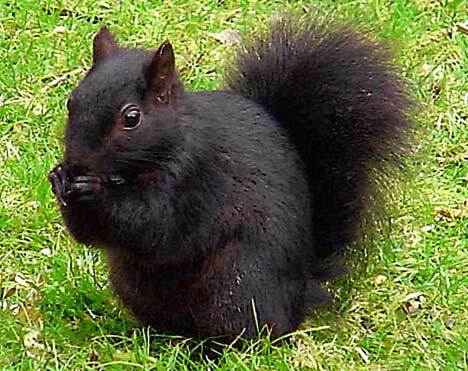 I was not aware of black squirrels. Thanks for reading my blog! A first for everything. Never seen a black squirrel before. A cute little chap. Whats weird is a long time ago, when I was little I was in New York and I fed a black squirrel some peanuts, nice little reminder, I like it! Wow what an exciting life you lead x I do envy you your travels! Enjoy every minute and post bits for us housebound armchair travellers to enjoy!! Brian: Great shot! Sure is a good looking squirrel…In Illinois, the city of Olny is noted for both black and white squirrels. Black squirrels have started showing up in the Peoria area the past few years. Thanks for the, “Like.” Hope you stop by again. I will! Great photo! the Choctaws have a legend that says total eclipse of the sun is when a black squirrel is eating the sun. I would love to use your photo of this squirrel when telling the story. Would you give me permission?